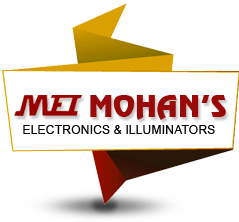 MOHANâ��S ELECTRONICS & ILLUMINATORS was incepted in the year 1981. It is located at Kochi in Kerala. Dr. V Mohan Das is the Owner of our organization, under whose headship we have been scaling new heights in our business endeavors. Mr. Das is an M.Sc, MBA, and PhD. His qualification has assisted us in developing all kinds of diverse Bio medical products. We have the firm backing of state of the art infrastructure at our manufacturing unit. Our unit is well equipped with all kinds of advanced machines and technology for the efficient production of Electromagnetic Equipment,Bio Medical Equipment, Acupressure and Magnetic Products,Magnetic Equipments, Health Care Products, etc. Quality is an integral part of our company. We are guided by a set of stringent quality control policies. According to the company policy, our entire range of products is tested on different parameters by our quality supervisor to ensure their flawless quality. We thrive on our well-coordinated distribution network. Our network is spread in every nook and corner of the country. The network has assisted us in reaching out to the clients in the faster and an efficient manner.